Through opportunities for continued education, professional accreditation, monthly professional development programs and annual conferences, FPRA offers its members professional support and keeps them up-to-date on developments in the ever-changing field of public relations. FPRA, the oldest public relations organization in the United States, was founded in 1938 by Lt. Col. John W. Dillin, the publicity director for the Miami Beach Chamber of Commerce. 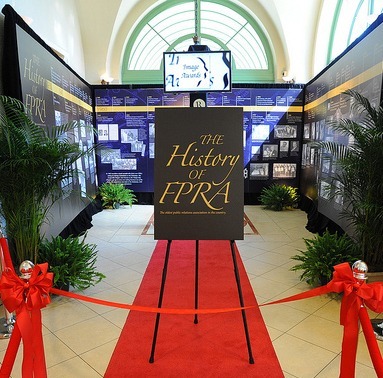 With a history of over 75 years, FPRA has developed a rich legacy that we’re proud of today. Dillin created the organization, originally known as the Florida Association of Publicity Directors, so that public relations professionals would have a forum where they could discuss the challenges they faced at work and learn how to better perform their jobs. The group’s first meeting attracted just over 50 practitioners, but that number has multiplied over the years. Though FPRA now boasts over 1,200 members and offers many additional services, its core mission – providing public relations professionals with the tools they need to achieve success and advance their careers – has not changed. See a list of FPRA’s Past Presidents.